Pot noble merchants are a couple of vendors in Sekiro: Shadows Die Twice. Both of them are from the same clan, and both live in big blue pots. One can be found in Hirata Estate, the other in Fountainhead Palace. They are collectors of treasure carp scales, and will give you rare items in exchange for them. Trading with them is the only way to get certain mask fragments, and there’s a quest that involves both of them. 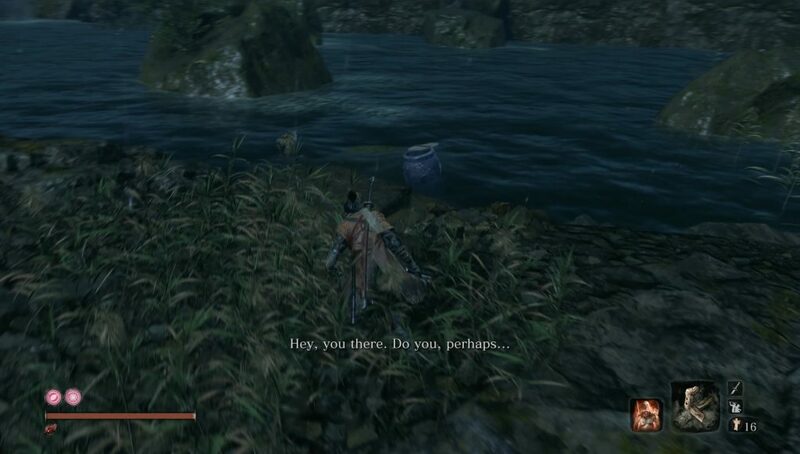 This guide will tell you everything you need to know about Sekiro pot noble merchants, Harunaga and Koremori. Pot Noble Harunaga is the one in the Hirata Estates area. When you first get there, you’ll soon see a long bridge crossing a river. When you get to the other side, turn right and follow the bank until you see a couple of beached boats. Look across the water, and you’ll see some rocks sticking out of the river and a bunch of reeds. Swim to this location, and you won’t be able to miss the carp scale vendor. Among other things, he’ll sell you the first mask fragment. Pot Noble Koremori is the one in Fountainhead Palace. To reach him, you’ll have to get to the fourth idol first, the one called Flower Viewing Stage. From there, you should make your way across rooftops and trees to the cliff on the left. The vendor will be next to the big there, and there’s even a Sculptor’s Idol next to him, to help you get there when you need to return. He’s the one selling the last mask fragment. Once you’ve bought enough from each of the pot noble merchants, they’ll both give you a piece of Truly Precious Bait. Each will urge you to use theirs to feed the giant carp and disregard the other one’s pleas, but the choice is ultimately yours. When you have the bait, go to the Fountainhead Palace Feeding Ground (for detailed instructions on how to get there, check out our Truly Precious Bait guide), ring the bell and feed the giant fish with whichever bait you want. The merchant you choose will have his wish fulfilled, and you’ll get a Lapis Lazuli as a reward. The other merchant will die, but his inventory will be transfered to the one that survives.